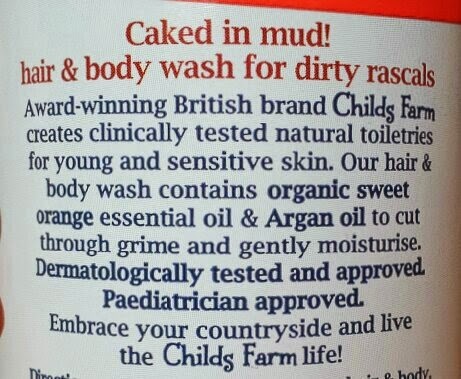 Childs Farm Caked in Mud! Hair and Body Wash is a wash that includes organic sweet orange and argan oils to help gently clean and moisturise even the most sensitive of skin, including eczema prone and new born. 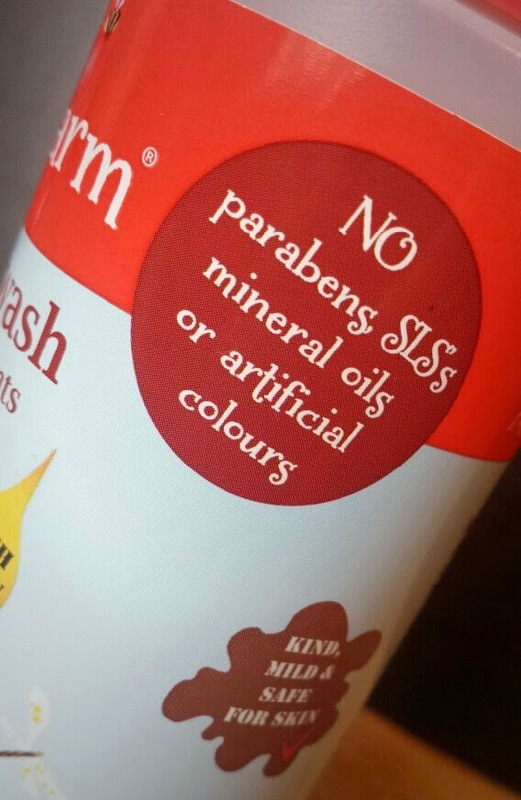 It contains 98% natural ingredients, no parabens, SLS's, artificial colours mineral oils, is pediatrician approved and is not tested on animals. Just like all other Childs Farm products, it undergoes clinical testing and trials to make sure that you are provided with safe, high quality products. 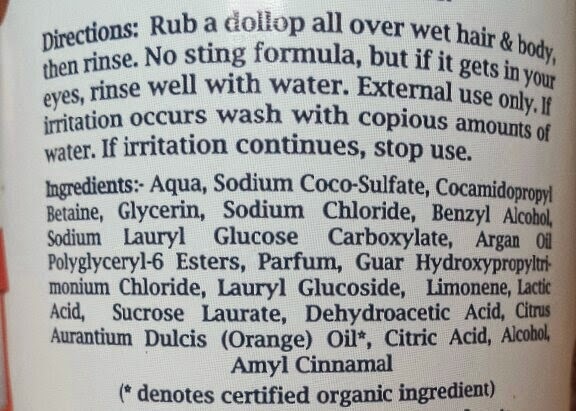 It also doesn’t sting if it gets into the eyes thanks to its “no sting” formula. Childs Farm is a brand that is designed to be appealing and fun for children on the outside, but are safe formulations on the inside. It was created by mum of two Joanna Jensen who wanted to provide a range of toiletries for children that contained absolutely no nasties. The product was created by Medichem International and the packaging is designed by children's illustrator Emma McCall and is based on animals that are found on Joanna's farm. Now there is also a cartoon based upon Childs Farm that airs on Cartoonito and the brand website has a section for printable pictures for children to colour in. Overall it is a brand that really lets you know that the children truly are the priority. The wash comes packaged in a long, translucent bottle that holds 250ml of product with a bright red push cap for the product to be dispensed. 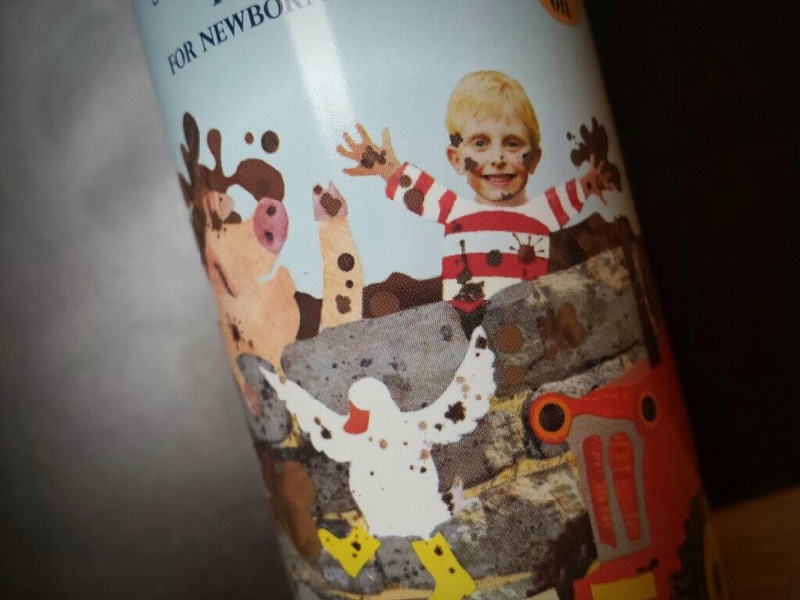 It also has a sticker around the bottle with the brand and product information as well as a funny picture of a young boy covered in mud, playing with the farm animals! Great for attracting children to the product. The wash itself is clear and of an average consistency. I've used a Childs Farm product on my little man in the past (the 3-in-1 swim) and I absolutely loved it. From the smell to the results, the fact that it's natural and organic, it was an all-round brilliant product. Therefore, myself and my partner knew that we wanted to give another product a go. The first thing that you notice about this wash is the beautifully fruity scent that it has. It's all natural sweet orange oil, so think of fresh, yummy oranges! So far this has been a common factor of the two products we have tried from this brand - great smells! Upon use, the wash lathers up easily on the skin and not too much either, which also makes it easy to rinse. On the hair it lathers up more, like a regular shampoo and rinses just as well as on the skin. The easy rinse is a great aspect because children don't tend to enjoy spending much time being washed. When in the bath it's either all about play with washing just getting in the way, or it's all about getting straight back out of there in which fast rinse helps to speed up the process. I'm sure all mums have had a situation where the phrase "hold on, let me just finish rinsing your hair" has cropped up! Well, this helps a bit on that front. After use, the skin is left clean and soft. My little man who is eczema prone doesn't react to it, so I can vouch for that claim. The smell doesn't linger on the skin, but I can imagine that if you team it up with a moisturiser from the range then you can have a great smelling bub. It does linger longer in the hair, however. This body wash is a brilliant product. Not only that, but I really like the whole personality of the brand. You know that you are using a product that is designed with all children in mind and with their best interests at heart. It also feels like a brand that is created with love behind it, and it comes through. You can buy a bottle of Caked in Mud! 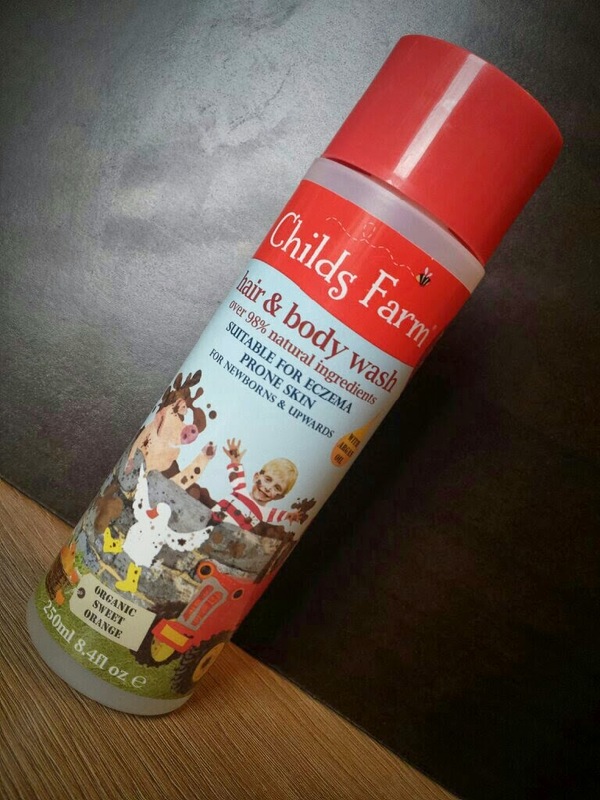 Hair and Body wash from the Childs Farm website for £3.99, or you can order a bottle from Amazon for the same price as well as subscribe and save for to save 5% and receive it straight to your door at intervals that you determine! No panicking when you begin to run out! Alternatively, you can grab a bottle from your local Boots or John Lewis also for the same price. Have you tried any Childs Farm products? Which is your favourite of the range?